A day after seeded players Alina Jidkova and Brittany Augustine advanced to the quarterfinals of the 2010 US Open National Playoffs – Women’s Championship, two other seeded players looked to do their part on Thursday to ensure their dream of earning a wild card into the 2010 US Open Qualifying Tournament would continue for at least another day. And just a few courts down from where former US Open champion Maria Sharapova reached the quarterfinals of the Bank of the West Classic, an Olympus US Open Series event, four more players reached the quarterfinals of the US Open National Playoffs with visions of equaling Sharapova’s 2006 US Open championship with a US Open title of their own this year. Thursday’s first round of play at the Taube Family Tennis Center on the Stanford University campus began with recent LSU graduate Megan Falcon, 25, of Baton Rouge, La., taking on 16-year-old Jessica Pegula of Boca Raton, Fla. Pegula came out firing, displaying the all-court game that propelled her to the final of a major ITF World Junior event in Brazil earlier this year, and took the first set from the more experienced Falcon 6-0. Pegula continued to dominate the match, taking a 4-1 lead in the second set before Falcon rallied and tied the score at 4-4. However, Pegula was ultimately too much for the former All-American and won the match 6-0, 6-4. The day’s second match featured two 18-year-olds who are taking their talents to college this fall, as No. 4 seed Courtney Dolehide of Hinsdale, Ill., faced Rachel Kahan of Unionville, Conn. In the day’s longest match, Dolehide, the future UCLA Bruin, jumped out to an early lead and took the first set. Momentum turned in the second, as Kahan, who is headed to Duke University, broke midway through the set and held on to force a decisive third set. After both players broke serve early in the third, Dolehide broke Kahan again up 5-4 to win, 6-3, 4-6, 6-4, in a match lasting well over two hours. The third match of the day featured former USC standout Maureen Diaz, 28, of Glendale, Calif., taking on fellow 28-year-old Katerina Sevcikova, a Westchester tennis pro who lives less than an hour from Flushing Meadows in Yonkers, N.Y. Though Sevcikova also played collegiately for the University of Missouri, she was overpowered on this day by Diaz’s dominant two-fisted groundstrokes, and Diaz cruised to a 6-2, 6-3 victory. The final first-round match of the US Open National Playoffs – Women’s Championship featured two players who have prior experience playing at Flushing Meadows, as the draw’s oldest player, 34-year-old Romana Tedjakusuma of Tracy, Calif., faced 22-year-old Alexandra Mueller of Abington, Pa. Tedjakusuma was looking to make her way back to Flushing Meadows for the first time since 1994, when she was ranked as high as No. 94 in the world, while the No. 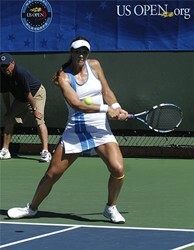 2-seeded Mueller competed in the 2004 US Open Qualifying Tournament as a 16-year-old. Mueller has been playing some of the best tennis of her career in 2010, winning four USTA Pro Circuit titles, and she continued her strong play on Thursday, using a mighty serve and hard, flat groundstrokes to run Tedjakusuma all over the court en route to a 6-2, 6-3 victory. The US Open National Playoffs – Women’s Championship continues on Friday with four quarterfinal matchups, as the four seeded players look to match the accomplishment of the four men’s seeds, who all reached the semifinals at last week’s Men’s Championship in Atlanta. Top-seed Alina Jidkova will begin the day of play as she faces future USC Trojan Kaitlyn Christian. No. 3 seed Brittany Augustine will face 15-year-old Canadian Evangeline Repic. No. 4 seed Courtney Dolehide will face Jessica Pegula, and No. 2 Alexandra Mueller will finish the day of play as she faces Maureen Diaz.